Saltwater fishing in Norway's fjords, for species like Sea Trout, Cod, Pollack (also known as Coalfish), Haddock, and others. Fishing for Atlantic Salmon and Sea Trout in Norwegian rivers that reach the fjords. These are anadromous fish — they return from the sea and make their way up the river to their spawning grounds, and along the way the fisherman has a chance to catch them. Norwegians sometimes call Salmon (Laks) the King of the River (Elvas Konge) and Sea Trout (Sjøørret) the Queen of the River (Elvas Dronning). From these "royal" nicknames, it's clear both fish are highly prized targets. Here you can find details on hundreds of Norwegian Fishing Rivers where Salmon and Sea Trout run. 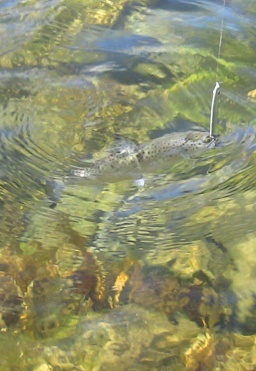 Fishing in Norwegian rivers and lakes for Trout. Because the lower stretches of rivers often are dominated by Salmon and Sea Trout fishing, freshwater (non-Searun) trout fishing is most associated with upper stretches or tributaries of rivers that reach the sea, and with mountain lakes and rivers. It's common for all of these opportunities to exist in the area of a single river system, frequently within a 5 to 10 mile radius. A motivated angler could pursue saltwater fish in the fjord one day, salmon or sea trout in the lower part of the river the next day, and trout in the river's upper reaches or tributaries on a third day. 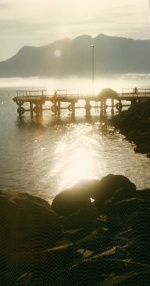 What's more, in the summer months north of the Arctic circle, the Midnight Sun enables one to fish in sunlight even in the night hours. I've spent many hours happily fishing while the rest of the family was asleep, a good point to note if you're travelling with people who don't fish. Norwegian fishing licenses are not required to fish in the fjords in Norway. But if you fish in a river or lake, you will need to know about requirements regarding both licenses and disinfection of fishing tackle.